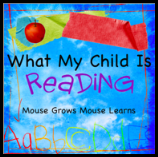 It's time for our "What My Children Are Reading" book reviews! This week we settled in with a few "ever so slightly scary" books, in preparation for the Halloween holiday at the end of the month. Both of our picks are brand-new 2010 picture books. Splat is a black cat, and it's Halloween. You wouldn't think he'd need much of a costume. You'd also think nothing could scare him. Think again. He's a scaredy-cat that's afraid of spiders and a scaredy-cat that needs a scary costume for his classroom Halloween party so he can win the scariest cat prize. He tries to come up with the perfect scary costume, and finally decides to dress as a spider with green and orange sock legs. Sadly, his peers don't find him all that scary, and he mopes about the classroom, feeling hopeless. However, circumstances change for the scaredy-cat as something goes "splat" while his teacher tells a scary ghost-story. The delightfully furry Splat makes such a cute, non-scary spider, and his antics generated a lot of laughs in our home, as always. Splat's silly expressions are priceless. For Halloween lovers, the book contains a version the familiar and popular, "In the dark, dark wood there's a dark, dark house" ghost story. That in itself, makes the book fun to read aloud. The beginning of the story seemed slightly disjointed, and we wish the real spider played more of a leading role in the story, but other than that the book is a pretty amusing Halloween read. My daughter had a lot of fun pointing out all the clever cat costumes (bat, vampire, skeleton, mummy and ghost). Chalk isn't a Halloween book, though it does have a scary component -- a dinosaur that comes to life! This wordless picture book starts out innocently enough. Three kids run across a bag full of chalk on a rainy day. Despite the rain they start drawing and discover the chalk has magical qualities. One girl draws a sun and it rises in the sky, driving the rain away. The other little girl draws a multitude of monarch butterflies, and they miraculously rise from the pavement and flutter in the sky. The little boy, in typical boy fashion, draws ... a dinosaur. The dinosaur that emerges is not a cuddly Barney type of dinosaur, but more the fierce, sharp gnashing teeth, realistic variety. The kids run for their lives and try to find a way out of the perilous predicament. Ever since I watched Mary Poppins as a girl, I've wanted to jump into a chalk drawing. But, after reading Bill Thomson's book, a chalk drawing popping to life looks just as fun, so long as no one draws scary dinos. This is the first time we've read a book illustrated by Thomson and, wow, are the illustrations ever impressive. His acrylic paint and colored pencil illustrations look amazingly realistic. 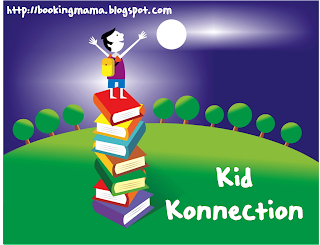 The book really stimulates the imagination and creatively shows children problem-solving for themselves. Because it is wordless, the reader must make up their own story while reading based on the illustrations. The magical quality of the chalk also provides plenty of inspiration. What would you draw if you had the chance to bring a chalk drawing to life? My daughter said she'd draw a kitty. My toddler son, apparently unfazed by the story, said he would draw a dinosaur!! And after reading Chalk, he tried drawing that dinosaur on the floor with marker. Thankfully, it was washable and didn't come alive. :) Guess the book must not be too scary. We recently borrowed Chalk from the library and my kids LOVED it. Great book. My four year old loved being able to tell the story herself. Those sound like great books! I love children's books, almost as much as I like adult ones hahaha! We've never read any of the Splat books. We should give them a try. I will note these books, right now we are not much for scary books. 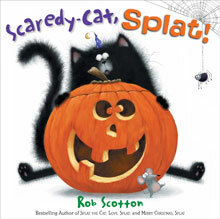 The cover art of the Scaredy-Cat Splat book is soooo cute! Those both look like books my little one would enjoy. Thanks! I will have to look into the Splat book. Spiders definitely not welcome around here, so Pip needs some positive exposure. I love your thorough reviews! Thanks for taking the time to write them. Goodness, drawing dinosaurs on the floor is scary enough for me :) Chalk sounds like an interesting book even though right now my daughter completely doesn't care for wordless books since she wants to read the words. Chalk looks and sounds so familiar. I just got Scaredy Cat Splat in the mail, can't wait to read it. Those both sound great. As soon as I get under my 50-item limit at the library we'll be getting those. We'll have to try Scaredy Cat Splat. I bet my 2 year old would like the pictures. He's getting in to looking at books independently and telling a "story" with the pictures.